Rock Row is a transformative 110 acre mixed-use development thoughtfully designed to complement state-of-the-art architecture with the site’s unique natural features. Through careful planning, Rock Row in Westbrook, Maine combines healthy urban living, destination retail, modern workplaces, select and full service hotels, diverse entertainment, and chef-inspired dining in a fun, convenient and immersive experience. 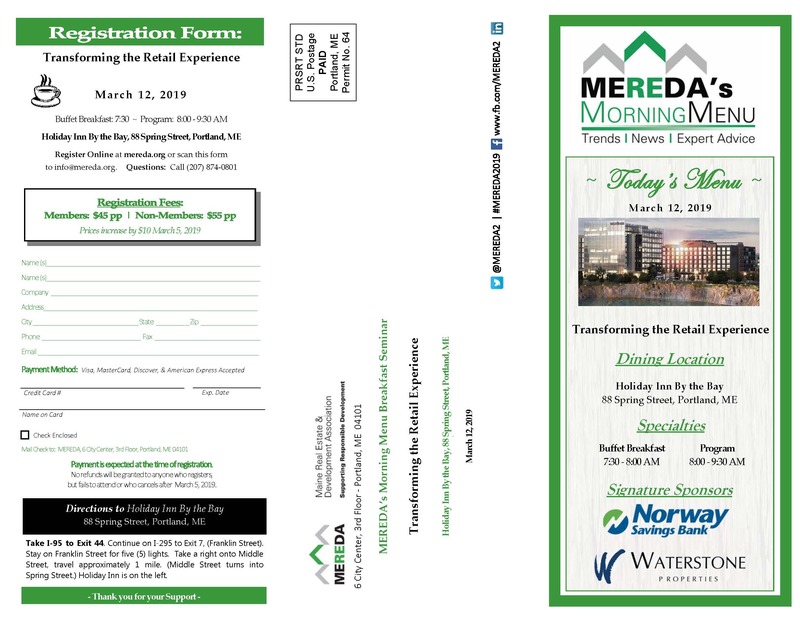 Mark your calendar to join us for breakfast on March 12 from 7:30 AM – 9:30 AM at the Holiday Inn By the Bay to discover how the transformation of the retail experience is taking shape in Maine. Josh Levy, Waterstone’s co-founding Principal, is actively involved in all facets of the company including site acquisition, permitting, and development, with a primary focus on Leasing for Waterstone’s 50+ shopping center portfolio and developing strategic leasing/development initiatives. Before starting Waterstone, Josh served as Chief Operating Officer of a privately held real estate investment company and was responsible for company operations and its Massachusetts portfolio. A graduate of Boston College, Josh holds a Bachelor of Science degree and has pursued continued real estate education through MIT, Boston University, ICSC and CCIM. He has been a guest lecturer at both Harvard University and Boston College, and is a member of the International Council of Shopping Centers, NH ICSC Next Generation Committee, Young President’s Organization, and Boston College TREK. Josh is actively involved with the Dakshana Foundation in India and other local Boston organizations. Trip Schneck is an industry-leading expert in specialty food, beverage (F&B) and entertainment procurement. Prior to the acquisition by Cushman & Wakefield, Trip, and his partner, Phil Colicchio, founded Colicchio Consulting where their work has given them a proven track record in the F&B industry in identifying, evaluating, conceiving, selecting, and contracting with food and beverage providers for food halls, hotels and shopping centers among other concepts. Since 2015, they have been at the forefront of “The Food Hall Movement”’, advising property owners and universities on the critical need for intelligently programming communal spaces to include authentic food and beverage offerings, markets, beer gardens, rooftop experiences and thoughtfully curated Food Halls. In 2017, they expanded to include the development of live performance. Your RSVP is requested by March 5, 2019. Payment is expected at the time of registration. No refunds will be granted to anyone who registers, but fails to attend or who cancels after March 5, 2019.